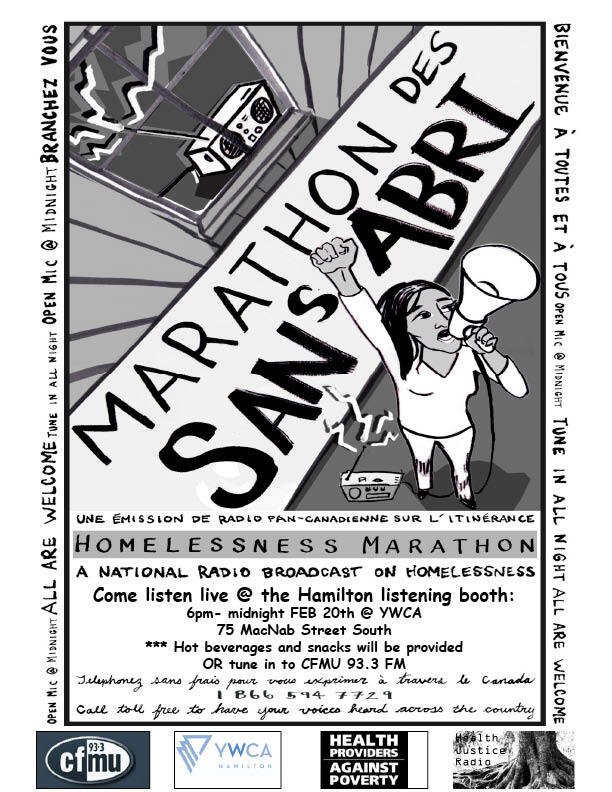 Health Justice Radio is teaming up with Health Providers Against Poverty, YWCA Hamilton and CFMU 93.3 FM to bring you the 2013 Homelessness Marathon! The Homelessness Marathon is a 14-hour live radio broadcast from the streets across Canada, about housing, homelessness, and poverty. The marathon aims to provide a national perspective on housing realities and homelessness from the perspective of those directly impacted. It is broadcast on more than 40 stations across Canada and runs all night from 5pm EST on Wednesday February 20th, 2013 to 7am EST on Thursday February 21st. Listen live online at http://cfmu.msumcmaster.ca/ or @ CFMU 93.3 FM. Each hour of the broadcast focuses on a specific theme related to housing. A toll free number allows anyone in Canada to call in to share their stories, opinions, and experiences of homelessness live on air. This year, Health Providers Against Poverty Hamilton, CFMU, Health Justice Radio, and YWCA Hamilton are working together to host a listening booth at the YWCA Hamilton from 6-12pm. We will also be hosting a live 30-minute segment on Health & Homelessness at 8:30pm. This will be recorded live at the YWCA Hamilton and will include interviews with women impacted by homelessness as well as local health care providers. A phone line will be available so that listeners can call in to the national broadcast at any time throughout the evening.